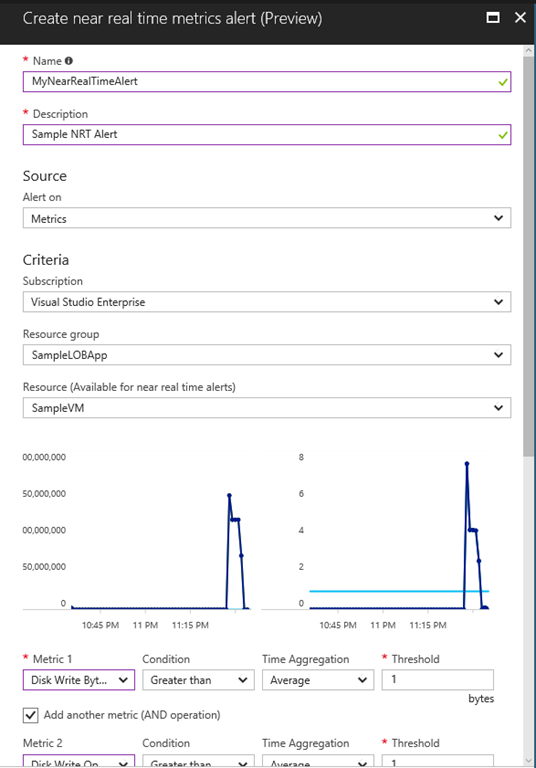 At Ignite 2017, we announced the public preview of near real-time metric alerts in Azure. This new kind of alerts provide the following improvements over the current metric alerts. Improved Latency – You can create near real-time metric alerts that monitor metric values as frequently as 1 minute. More control over metric conditions – You can create near real-time metric alert rules that can monitor minimum, maximum, average, and total of the metric over the evaluation period. Combined monitoring of multiple metrics – You can create a single near real-time metric alert rule that can monitor multiple metrics (currently two) at the same time. Modular notification system – You can use action groups with near real-time metric alerts. Action groups provide a reusable set of actions that can be used with multiple alerts. By using action groups with near real-time metric alerts, you can send SMS, email, or call web hook when an alert gets triggered. Let’s look at how to create a near real-time metric alert. 1. 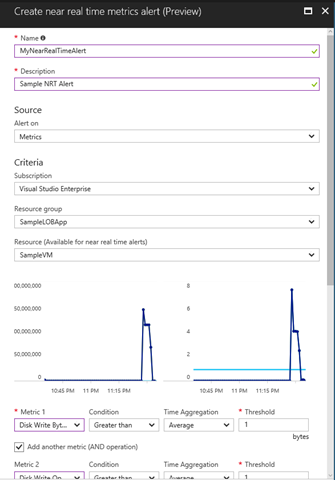 In the Azure portal, locate the resource you are interested in monitoring and select it. You can also do the same for all supported resource types centrally from Monitor>Alerts. 2. 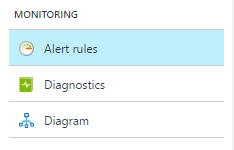 Select Alerts or Alert rules under the Monitoring section. The text and icon may vary slightly for different resources. 3. Click the Add near real time metrics alert (preview) command. If the command is grayed out, ensure the resource is selected in the filter. 5. Select the Metric you want to monitor, then choose a Condition, Time Aggregation, and Threshold value for the metric. 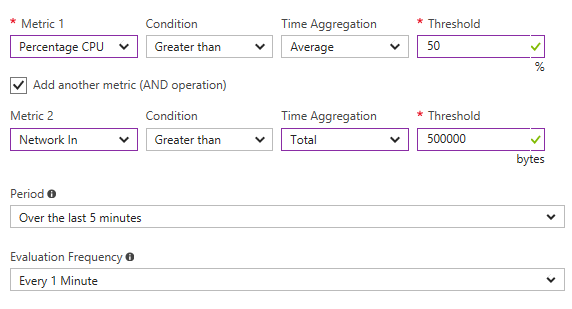 Optionally, select another Metric you want to monitor, then choose a Condition, Time Aggregation, and Threshold value for the second metric. 6. Choose the Evaluation Period and Evaluation Frequency. 7. Specify if you want to use a New or Existing Action Group. 8. If you choose to create New Action Group, give the action group a name and a short name, specify actions (SMS, Email, or Web hook) and fill respective details. 9. Select OK when done to create the alert. How does a near real-time alert work? Starting at around when the alert was created, the alert will look at the past 5 minutes of data for %CPU Usage and NetworkIn metrics, calculate the average %CPU Usage and Total NetworkIn values, and check if they are above their respective thresholds. The alert will fire only if both the thresholds are breached. The conditions are evaluated again after 1 min. The alert is resolved if one of the metrics go below their thresholds. For a full list of supported resource types, see the documentation. Support for more resources is coming soon. For more information on near real-time metric alerts, see the documentation. We would love to hear your feedback. Send us any questions or feedback to azurealertsfeedback@microsoft.com.